Winter is here! Christmas is fast approaching, and our office team is ready for the Christmas gift rush. We have already started sending out our Champagne Balloon Flight Vouchers by email and post and started the list for Balloon in A Box deliveries. If you’ve decided to get that special someone a Hot Air Balloon Flight experience for Christmas, then you’ve come to the right place. Whether you order online early or you’re still deciding – we are here until 22nd December 2017 to take your orders and send out your vouchers in time for Christmas! 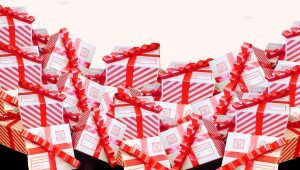 You have three delivery options which are a printable e-voucher package, 1st class postal package or our Balloon In a Box – a red candy stripped box wrapped with a big red bow makes the perfect gift for under your Christmas tree. Unwrap it to discovery your adventure begins as a helium balloon floats out to surprise your loved secured by a ribbon wrapped gift envelope. Our deadline for postal orders is Wednesday 20th December 2017 (Royal Mail First Class or pay for special delivery to arrive by 22nd December), Balloon in a box gift packs will be sent out by special delivering arriving by the 22nd December (the last order deadline is 3pm on the 21st December) and our emailed vouchers orders can be taken 24 hours a day even on Christmas day! Treat your loved one’s or yourself to a flying experience, we have voucher options to suit all budgets, take a look here – we are sure you will find an experience you and you’re loved ones can’t wait to take come spring! You can book online or call us on 01404 823 102 where our friendly office team are ready to answer any of your questions and confirm your booking. Our main flying season begins in mid-March till the end of October, so your 12 months voucher is valid for a full flying season. Once you’ve received you voucher please feel free to book a flight date online or just give our office a call and we can schedule your flight for you (subject to availability and suitable weather). 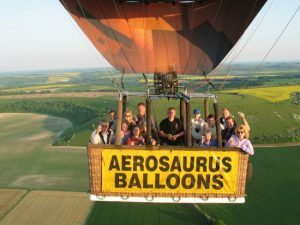 Remember that you can add In-flight photos to your Champagne Balloon Flight vouchers to commemorate your ballooning experience. 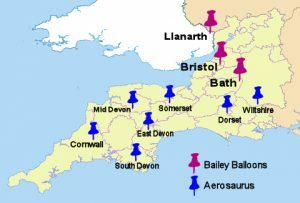 We look forward to flying all our passengers and we look forward to flying you in the South West – just read some of our recent Trip Advisor reviews and you’ll be reassured that our team is there to make sure you have a wonderful hot air balloon flight experience. “Just wanted to write a review say thank you so much for our balloon experience, we thoroughly enjoyed the whole morning from start to finish, My husband thought it was great helping inflate the balloon (I took lots of photos of him actually working hard)! It was a great experience for the whole family, the team all made our 11 year old son feel so at ease and part of things (how great to tell his mates he stood inside a hot air balloon while it was on its side being inflated). So, for all of us here at Aerosaurus Balloons, we wish you all the best this season and we look forward to flying you in 2018!